With global equity markets continuing to reach new all-time highs, bears are increasingly vocal, pointing to market complacency, stretched P/E valuations and political and social unrest. But in healthcare equities, the story is simpler. With healthcare spending expected to grow at 6% annually over the next 10 years (Source: CMS), far outstripping the 3% growth in overall GDP, waning fears of dramatic negative policy reforms, and with the S&P healthcare P/E (16.8x) below the overall market (18.0x), we continue to see strong near-term returns in healthcare investing. After a rocky 2016, healthcare stocks have staged a stunning rebound in the first three quarters of 2017, and no sector has performed better than biotechnology. The broad Nasdaq Biotech Index, while still 15% off its 2015 highs, has rebounded significantly and is up 28% YTD. Our affiliated BBC ETF which holds early-stage biotechnology companies is up a stunning 61% YTD, and sub-indexes of transformative technologies such as gene therapy have even more impressive gains (up 81%). While we attribute the first leg of this rally to value buyers buying for a bounce, the latest moves have been direct results of major positive clinical and corporate events. For example in late September, Alnylam announced the industry’s first positive Phase 3 trial for an RNA interference-based product, a transformative technology, with broad implications for biotech drug development. Also this year, we have seen numerous advances in gene therapy, a technology which corrects defective genes, across a broad range of conditions. Moreover, the pace of M&A activity in the sector picked up in late August when Gilead announced the $12 billion acquisition of Kite Therapeutics (spun out of Israel’s Weizmann Institute), a leader in the nascent field of immuno-oncology and CAR-T.
Biotechnology IPO activity is an important indicator of the risk appetite among investors for early stage biotech investing. Over the past 10 years, we have seen a trend toward earlier-stage IPOs, with companies now able to go public with only Phase 1 data, and in the heated 2015 markets some with only pre-clinical (animal) data. 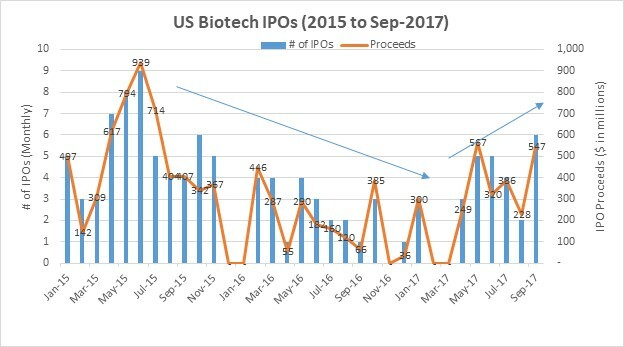 In 2016, the biotech market was slammed shut, but it has slid back open with 25 IPOs successfully priced since April 2017. In fact, several high quality, venture-backed IPOs were more than 10x oversubscribed, including Nightstar Therapeutics and Sienna Biopharma and have performed very well in the aftermarkets. 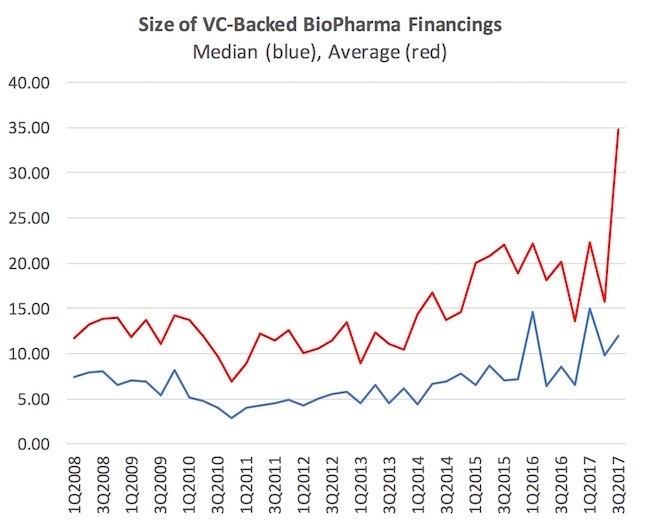 In private stage funding, activity levels remain consistent and robust with approximately 100 private financings for biotech companies per quarter. However the most significant trend in these financings over the past year or two has become the increasing prevalence of the mega Series A round. For example, among the recently announced Fierce15, a group of promising startups selected by the biotech news site FierceBiotech, seven have raised $50+ million Series A rounds, with two companies raising more than $100 million (Gritstone and Vir). In Q3, private financings in the biotech sector totaled $3.6 billion, the largest quarterly sum in history. And while crossover fund investments (typically from hedge funds and large mutual funds) had been quiet, activity level is certainly picking up as the prospects of capital market exits increase. As a reminder, in March 2017, we invested in Rocket Pharma’s $25 million Series B round at a $[CONF] million pre-money valuation. Rocket is an emerging gene therapy company focused on devastating inherited diseases. On September 12th, Rocket Pharma announced that it agreed to complete a reverse merger into publicly traded Inotek Pharma (ITEK). Inotek is led by highly experienced pharma/biotech executive David Southwell who previously was CFO of Human Genome Sciences and Sepracor, two exceptionally innovative biotechnology companies which reshaped the biotechnology sector before being acquired. Inotek as a stand-alone company had fallen on hard times as its drug pipeline failed, but with approximately $50 million in cash and liquidation value, the company undertook a rigorous strategic process which culminated in Inotek proactively reaching out to Rocket as a merger partner. David will join the board of the combined company, but Rocket’s CEO Gaurav Shah will remain the sole CEO. Rocket’s merger is expected to be completed in Q1 2018, and based on publicly available information and yesterday’s closing ITEK price of $1.94 per share, we calculate a “pre-money” valuation of $220 million for Rocket, and a pro-forma valuation of $270 million including ~$50 million of new cash from Inotek’s balance sheet. As a consequence of the merger, Rocket will inherit a clean public biotech shell, a blue chip investor list, and a considerable cash cache at a valuation above what we expected this soon after our Series B investment. The entire gene therapy sector is breaking barriers as a novel therapeutic class with stunning data recently announced across a broad range of diseases: Voyager Therapeutics in Parkinson’s disease, AveXis in spinal muscular atrophy and REGENXBIO in age-related macular degeneration / AMD (a form of blindness). In this environment, we believe Rocket’s world class management team with a newly strengthened balance sheet and a public market currency can create tremendous value through selective business development activities and collaborations. On September 26, we closed on a $23 million Series A round for Engage Therapeutics, which is moving into a Phase 2b trial with Staccato Alprazolam, its easy-to-use handheld device that delivers a single dose of drug quickly to the brain (in under 30 seconds) in order to stop epileptic seizure activity. 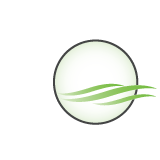 As many of you know, LifeSci has been closely involved with Engage since last November. Getting this deal completed was a tough battle, and several times during the process the prospects for closing the round looked grim. But thanks to the dogged persistence and perseverance of CEO Greg Mayes and his team (with an assist from our affiliate LifeSci Capital which acted as placement agent in the transaction), Engage was able to put together a world-class investor group including TPG, Adage, Lumira, Granite Point, and our own affiliated LifeSci venture funds. The fully diluted pre-money valuation of $[CONF] million resulting in a post-money of $[CONF] million makes for tremendous upside for the Fund if the Phase 2b study is positive, and we expect results in late 2018. In addition, the management team is already fast at work on adding additional value enhancing, non-dilutive programs. As we move forward towards the end of the year, our deal pipeline is extremely robust. While we continue to see many opportunities in biotechnology, we are also seeing high quality investment opportunities in medical devices and digital health. These opportunities span from Series A rounds to going-public/IPO rounds. At this point we expect that we will call an additional 20%-30% of your capital commitment spaced out over the next six months as appropriate. Our affiliated business units (LifeSci Advisors, Public Relations, Capital and ETFs) continue to grow at a rapid pace and we have recently hired our 40th employee, opened a 5-person Boston office, and hired a former sell side medical device analyst to work under the LifeSci Partners umbrella. We look forward to providing additional updates to you and thank you for your support.